"Cilantro" redirects here. It is not to be confused with the related herb Eryngium foetidum, also known as "culantro" or "Mexican coriander". "Chinese parsley" redirects here. Chinese parsley may also refer to the unrelated herb Heliotropium curassavicum. ^ a b Carly Ledbetter (6 December 2017) [2015-06-24]. "Science Explains Why Cilantro Tastes Like Soap for Certain People". Huffington Post. Retrieved 12 January 2018. ^ Lewis, Charlton T. "coriandrum". A Latin Dictionary. ^ Liddell, Henry George; Scott, Robert. "κορίαννον". A Greek-English Lexicon. ^ "Coriander", Oxford English Dictionary 2nd ed., 1989. Oxford University Press. Chisholm, Hugh, ed. (1911). "Coriander" . Encyclopædia Britannica. 7 (11th ed.). Cambridge University Press. p. 146. ^ "The Linear B word ko-ri-ja-da-na". Palaeolexicon. ^ a b c "Coriander (Coriandrum sativum)". Gernot Katzer Spice Pages. 29 February 2012. Retrieved 1 July 2018. ^ Fragiska, M. (2005). "Wild and Cultivated Vegetables, Herbs and Spices in Greek Antiquity". Environmental Archaeology. 10 (1): 73–82. doi:10.1179/146141005790083858. ^ Ramcharan, C. (1999). J. Janick (ed.). "Perspectives on new crops and new uses – Chapter: Culantro: A much utilized, little understood herb". ASHS Press: 506–509. ^ a b McGee, Harold (13 April 2010). "Cilantro Haters, It's Not Your Fault". The New York Times. Retrieved 24 July 2012. Some people may be genetically predisposed to dislike cilantro, according to often-cited studies by Charles J. Wysocki of the Monell Chemical Senses Center in Philadelphia. ^ Bruce Smallfield (June 1993). 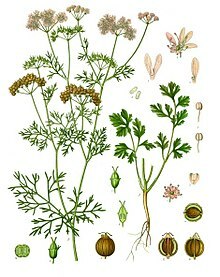 "Coriander – Coriandrum sativum". Archived from the original on 4 April 2004. ^ "Dhana Jeera Powder – Also Known As Cumin and Coriander Blend or Dhanajiru Powder". My Spice Sage. Retrieved 14 January 2016. ^ Silva, Filomena; Ferreira, Susana; Queiroz, Joao A; Domingues, Fernanda C (2011). "Coriander (Coriandrum sativum L.) essential oil: its antibacterial activity and mode of action evaluated by flow cytometry". Journal of Medical Microbiology. 60 (Pt 10): 1479–86. doi:10.1099/jmm.0.034157-0. PMID 21862758. ^ Brennan, Eric (26 February 2015). "Effective Intercropping for Biological Control of Aphids in Transplanted Organic Lettuce". eOrganic. Retrieved 4 April 2017. ^ "Nutritional Data, coriander seed, per 100 g". nutritiondata.self.com. Conde Nast. Retrieved 10 August 2013. ^ Zheljazkov, V. D; Astatkie, T; Schlegel, V (2014). "Hydrodistillation extraction time effect on essential oil yield, composition, and bioactivity of coriander oil". Journal of Oleo Science. 63 (9): 857–65. doi:10.5650/jos.ess14014. PMID 25132088. ^ Rubenstein, Sarah (13 February 2009). "Across the Land, People Are Fuming Over an Herb (No, Not That One)". The Wall Street Journal. Retrieved 24 July 2012. ^ Ewen Callaway (12 September 2012). "Soapy taste of coriander linked to genetic variants". Nature. doi:10.1038/nature.2012.11398. ^ Josh Kurz (26 December 2008). "Getting To The Root Of The Great Cilantro Divide". NPR. ^ a b Moneret-Vautrin, D. A; Morisset, M; Lemerdy, P; Croizier, A; Kanny, G (2002). "Food allergy and IgE sensitization caused by spices: CICBAA data (based on 589 cases of food allergy)". Allergie et Immunologie. 34 (4): 135–40. PMID 12078423. ^ Kathleen Pointer (29 March 2017). "How to Recognize a Cilantro Allergy". Healthline. Retrieved 17 March 2018. ^ Christina Agapakis (18 September 2011). "Allergy Recapitulates Phylogeny". Scientific American. Retrieved 17 March 2018. ^ a b c Tucker, A.O. ; DeBaggio, T. (1992). "Cilantro Around The World". Herb Companion. 4 (4): 36–41.